If you struggle to get to sleep at night there are many different food types that can help induce sleep. Our bodies are sensitive machines. They react to what we eat and drink. The substances we ingest can make a huge difference to our lives. It has long been known that certain food types can help you to fall asleep and give you a better quality of sleep. Furthermore modern science has shown that there is evidence that backs up these long held beliefs. So if you are struggling to sleep or have a sleep disorder then before you try sleeping pills, you should try modifying your diet. It can have dramatic results and is far better for you than taking drugs to sleep. Fish is an excellent food for sleep, especially tuna and salmon. Both these fish contain high levels of vitamin B6 which is essential in the production of melatonin (a sleep-inducing hormone that is triggered by darkness). Another sleep inducing food is jasmine rice. Jasmine rice has a high glycemic index rating and it triggers a larger amount of insulin to be released into the body. This in turn increases the ratio of sleep-inducing tryptophan relative to other amino acids, allowing more to get to the brain. Dairy products can also help you sleep as they are high in calcium. Calcium is known to help people sleep. Dairy products work on increasing the ratio of the amino acid tryptophan. A bowl of yogurt during the evening will help you get to sleep and stay asleep, though stay clear of any with too much sugar. Another good snack that you can have during the night which will help you to get to sleep and stay asleep is almonds. Almonds contain magnesium, which helps promote both sleep and muscle relaxation. They also have the added benefit of supplying proteins which can help maintain a stable blood sugar level while sleeping. Almonds promote sleep by switching you from your alert adrenaline cycle to your rest-and-digest cycle. 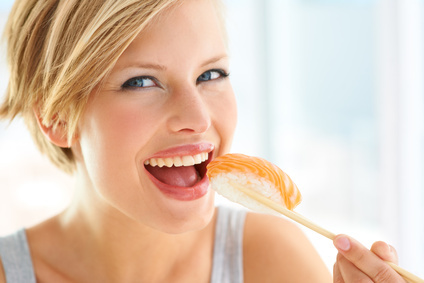 Fish is an excellent source of B6 which is used to make melatonin, a sleep inducing hormone. Jasmine rice has a high glycemic index rating which will elevate your ratio of tryptophan. Dairy products also work on the tryptophan levels, helping you get to sleep. Almonds are a good snack at night as they have magnesium in them, which promotes sleep and muscle relaxation. If you are struggling to sleep well consider changing your diet. Not only is it really effective but all of the foods are healthy too. Making good dietary changes should be the first step for anyone with a sleep disorder though it is important to consult a medical expert as well.